Toby Fox has teamed up with Fangamer to release the Undertale Collector’s Edition for Nintendo Switch, with pre-orders now open. 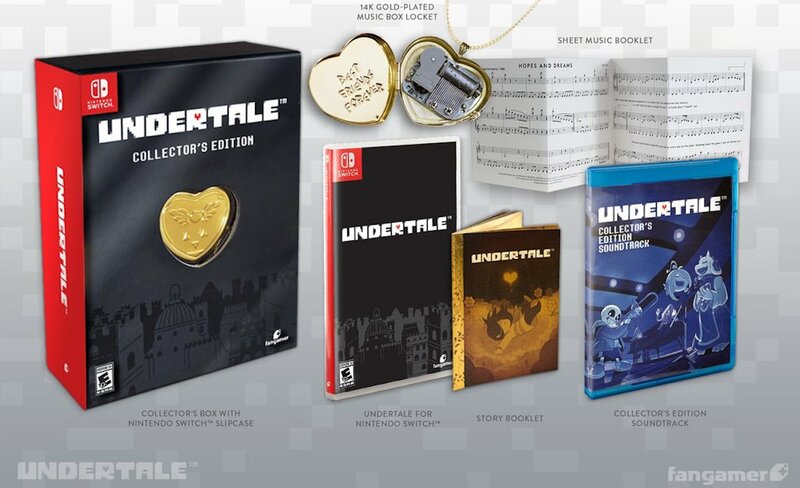 The Collector’s Edition ($69) comes with a 2-disc Undertale soundtrack with more than 100 tracks, an Undertale sheet music booklet with annotations by Toby Fox for six tracks, a 14k gold-plated brass music box locket, a sturdy matchbox-style collector’s box and a physical copy of Undertale for the portable home console. There is also a Standard Edition ($29), and, whichever edition you choose, you will receive a 24-page story booklet illustrated by Temmie Chang. In Undertale, you play as a human who falls underground into the world of monsters. It is down to you to find your way out or risk staying trapped forever – with the game having a soulful, character-rich story with an emphasis on humour. You don’t have to kill the monsters that you encounter, and can instead choose to negotiate your way out of danger using the unique battle system. Otherwise, if you’d rather slaughter everything in your path, you can time your attacks for extra damage and dodge swipes from your enemies. Undertale, and the Undertale Collector’s Edition, will release for Nintendo Switch worldwide in September.